Rainbow Riches is another tremendous game, one that is incredibly popular among the online slot game community. The series has developed games with the Irish theme well, not taking itself too seriously or too silly as it creates game after game, each with different features to enjoy if you decide to play Slots Baby's new slots. This Pick n Mix variety of Rainbow Riches is among the best of the lot with its unique feature simply being the sheer amount of features! 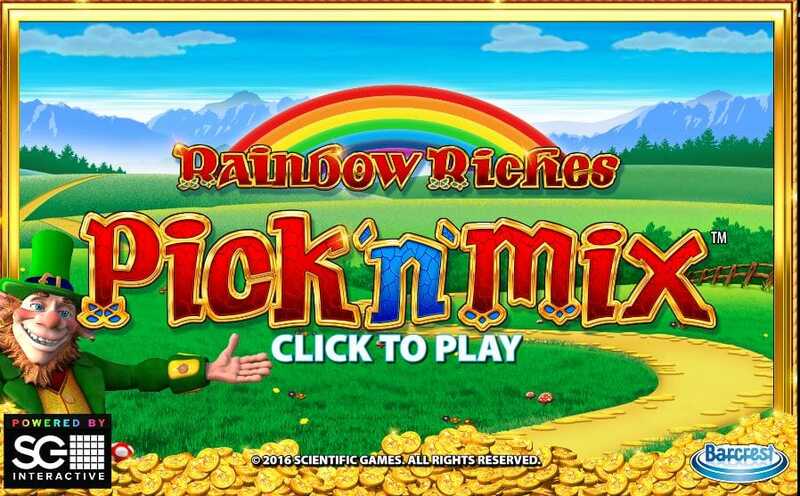 Plenty of different ways to win are the order of the day, here, as once again rainbows, leprechauns, pots of gold and other relics of the Irish slot return in this instalment of Rainbow Riches no deposit slot game. What do you expect from a game in the Rainbow Riches series? Well, put quite simply, you expect a leprechaun or two (or five or six) with a slightly peculiar look on their face. Almost too happy a helpful they are but don't fret, these little rascals are here to help you win your pot of gold however much that might be. As a game from slot game royalty in Barcrest, a developer who have been making slot games since the days when you could only find them in pubs, you expect a somewhat classical feel, too and the authenticity that comes with that. 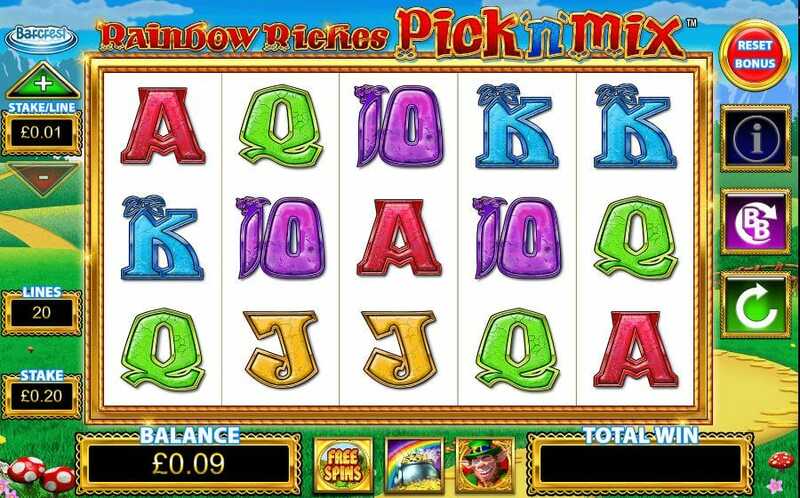 This is all present in Rainbow Riches Pick n Mix, with the Irish theme quite an old school one but one that's explored in a way that only an online slot can do, with so many bonus features that you won't find in your local boozer. Visit our slot promotions page before you play the game! As mentioned, the game itself is packed with bonus features and different ways to trigger them. This is, after all, where the Pick n Mix part of the game’s name comes from, as the player has the ability to enjoy a variety of sweet bonus features and mini games that will all help get the wins up in different ways. Another in the line of Rainbow Riches game, if you like the way this game is designed in terms of layout or in terms of its decent sense of humour, it's definitely worth exploring more of the series. You can start with the original Rainbow Riches - one of the most popular online slots there is - or go for another sequel such as Rainbow Riches: Reels of Gold. Road to Riches Bonus Feature - Activated when you get 3 or 4 scatter Road to Riches, during this mini game you want to see how long along the path you can get, collecting multipliers on the way. 3 scatter Road to Riches will produce the standard road multipliers, as will 4 of them, with the difference than being a higher average win. However, if you land 5 of the scattered bonus symbols in question you’ll get a multiplier of 500x your total bet! Land on the ‘Collect’ to collect your multiplied winnings. Pots of Gold Bonus - Land yourself 3 or 4 scattered Pot of Gold symbols to trigger this bonus. If 3 Pot of Gold symbols land, gold, silver and bronze pots spin around screen whilst 4 of the, will just give you gold and silver. 5 is the best, as only gold pots will be involved and, as you’d expect, this means that the wins are going to bigger. When the pots eventually stop spinning, the multiplier that goes with the selected pot will then be awarded and could be up to 500x your bet. Cash Crop Bonus Feature - Here, you’ll see a 10x5 grid of 50 coins. Spin again and they’ll either draw a blank or a multiplier. Multiplier coins are added up so hope that you don’t draw too many blanks. The final accumulated multiplier for the round multiplies the bet that you placed on the spin that triggered this round and then it all goes to a coin toss. If the coin displays “Go On” then another 10 x 5 grid of coins pops up and the round will carry on. If it lands on collect, you’ll collect your winnings and return to the wheels, richer for the experience. Magic Toadstool Bonus Feature - This is another chance to get another 500x your total bet. To do so, you’ll need to get 5 Toadstools on the reels but landing 3 or 4 will activate this bonus round, too. Similar to the prevails mentioned Cash Crop Bonus, a 6x4 grid of these toadstools appear and you have to pick only 3 of them. What’s different here is that you’ll either get a cash prize of a fairy, who has the power to win you even more. Free Spin Bonus Feature - Last but not least, there’s a Free Spins feature here, too. What’s more is that during such spins you can unlock any of the aforementioned bonuses, too. As mentioned, the developers of this game are the widely respected, BarCrest. One of the most established creators of slot games, they have been in the game for a long time - even before the online casino industry eclipsed those in pubs, clubs, bars and chip shops. They are true legends of the fruit machine game and are now part of a larger organisation called SC Gaming. It is through SC that this developer has developed itself, evolving into the online slot game realm with style and adapting classics for a new market.